First Friday deadline: Bueller? Bueller? It looks as though the monthly fiction contest will take a hiatus. My inbox received only one entry, and today is the deadline. If another 500-word story appears before midnight, we'll have the makings of a contest! 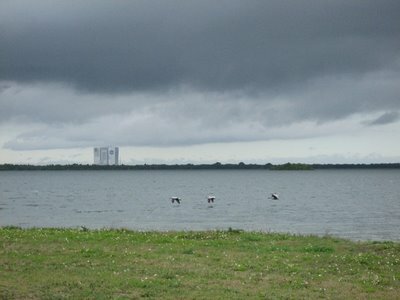 As I raced toward the Kennedy Space Center visitor complex for the Wild Side of the KSC field trip, I had to laugh at the sight of a Black Vulture with its wings stretched out as it walked headfirst down a telephone wire, balancing like a circus performer on a tightrope. In addition to Bald Eagles, Globby Ibis, White Ibis and alligators, we saw Double-crested Cormorants, Brown Pelicans and Roseate Spoonbills before and during our first stop at station F on the causeway. 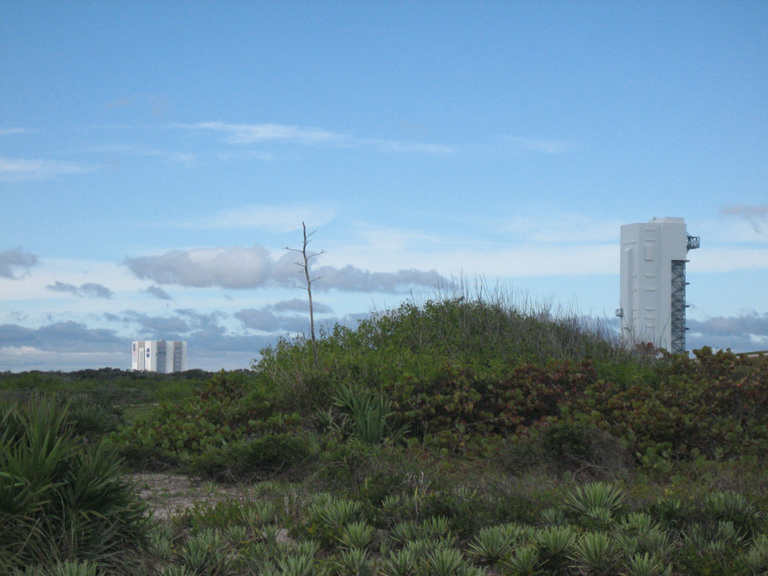 In the distance, you can see the Vehicle Assembly Building -- one of the largest buildings in the world -- behind the three BRPEs. 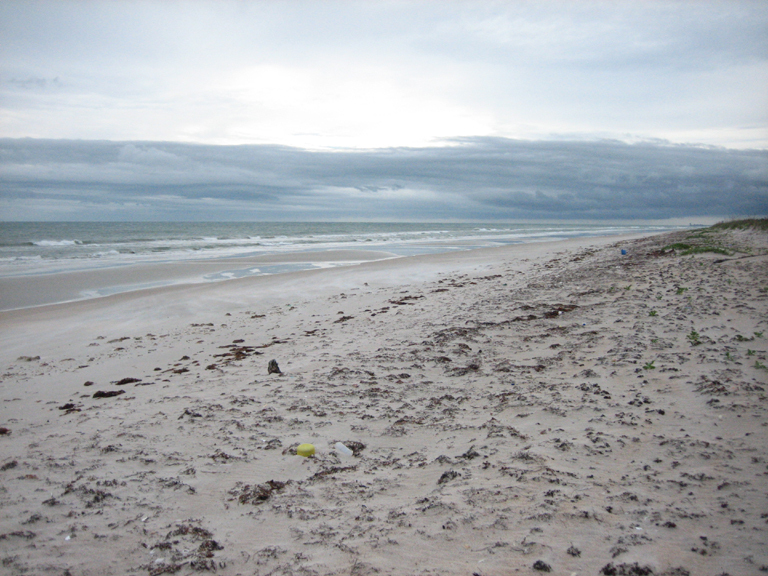 During turtle nesting season, loggerhead, green and leatherback turtles lay eggs on this isolated beach. 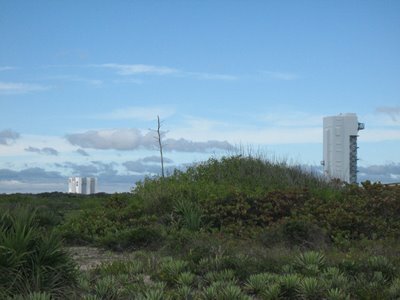 Human visitors typically are limited to the astronauts and their friends and family, who might stay at the house prior to a shuttle launch. A later stop provided an opportunity for leader Sarah Linney to lure the jays with shelled peanuts. I hope to see more of the colorful creatures at next year's festival. Maybe I'll see you there, too? Writer, bird bander and naturalist Scott Weidensaul presented the keynote on Saturday evening. His attention-grabbing talk, "Return to Wild America," included images from his 2003 trip around North America that replicated the path taken by Roger Tory Peterson and James Fisher in 1953. Festival founder Laurilee Thompson introduced Weidensaul. 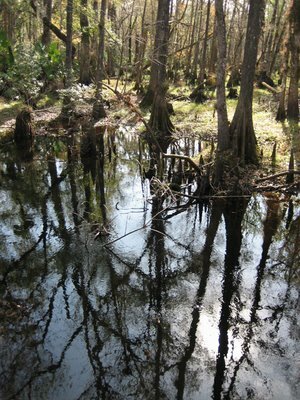 Weidensaul said friends and colleagues warned him that his trip would depress him because of unfortunate changes to the habitat in the last 50 years. Instead, he said, "I came away incredibly energized and incredibly optimistic." 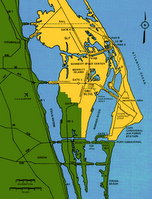 In 1953, little to no protections were in place for the environment and wildlife. 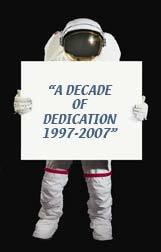 In the intervening years, many steps have been taken to conserve and preserve the natural world. "Wild America is still out there," Weidensaul said. Citing such instances as the return of Wild Turkeys to New York's Manhattan Island and the success of Grupo Ecologicao Sierra Gorda in Mexico, Weidensaul painted a positive picture. 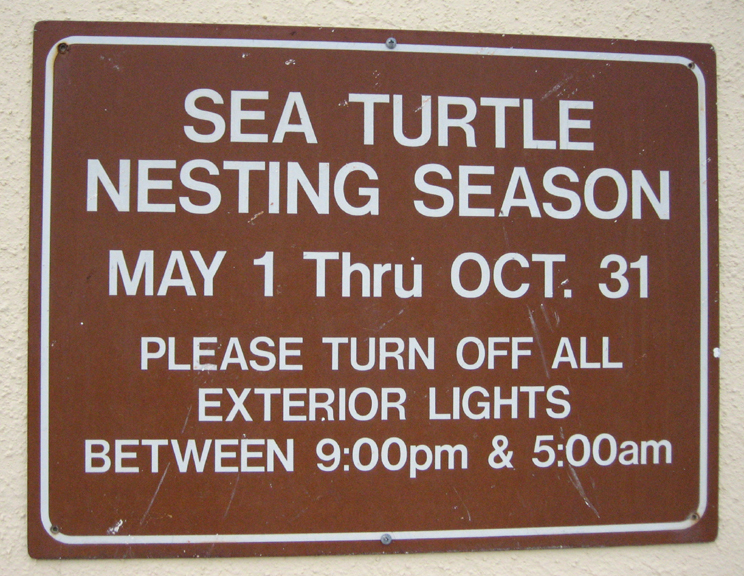 He didn't, however, neglect the challenges that face locations such as Florida's Dry Tortugas or the Everglades, where wading bird populations have declined 90 to 95 percent since 1953, as well as Alaska's Yukon Delta, where the rising Bering Sea now floods out the birds' nests every other year rather than every 10 to 15 years. Weidensaul finished his journey in Alaska's Pribilof Islands on St. George Island, where he savored "a glimpse of an older and more complete world" that included "clouds of auklets and murres." The naturalist remains optimistic about the presence of open habitat and wildlife in North America. Citing the progress since 1953 in protecting natural resources and re-introducing species, he said, "We can do far more than we think we can, and we are responsible for dreaming big dreams." 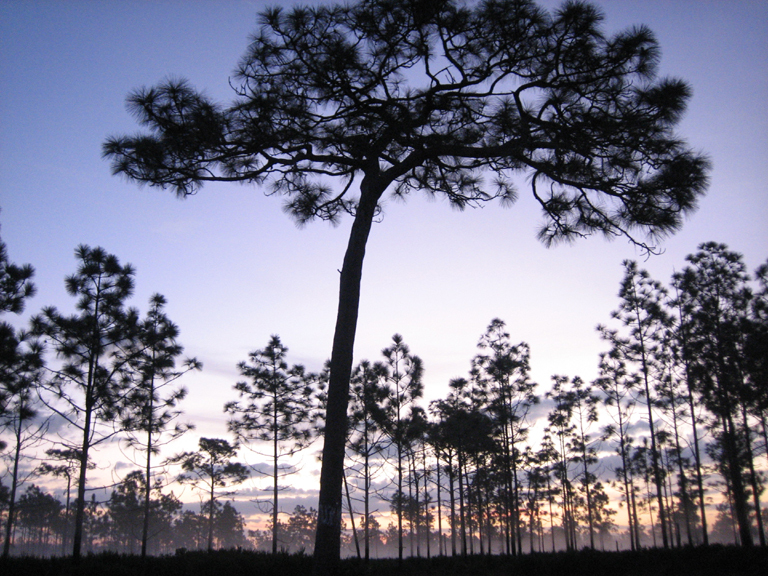 The Hal Scott Preserve field trip had us in place, in front of a longleaf pine tree, before the sun rose. 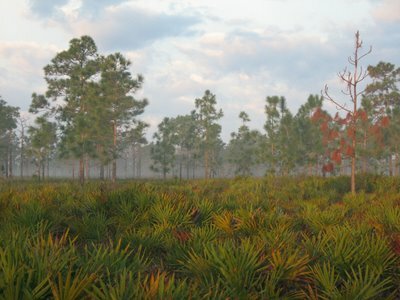 Our quarry: an endangered Red-cockaded Woodpecker. A bird did appear in the cavity of that tree and briefly explored the upper-right branches before flying back to another tree to feed. We saw three more RCWO during our chilly visit to this spot. 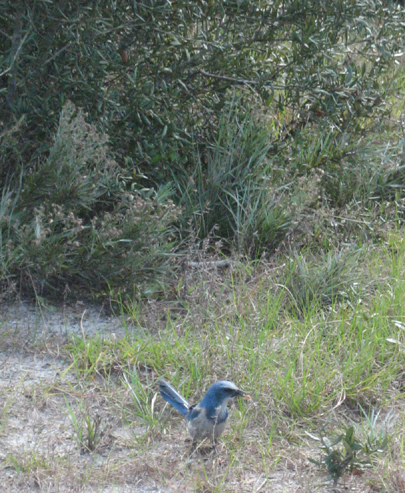 We also enjoyed Eastern Bluebirds, Eastern Meadowlarks and Loggerhead Shrikes before driving to the next area. I got a kick out of all the Black Vultures there and liked hearing their loudly flapping wings. 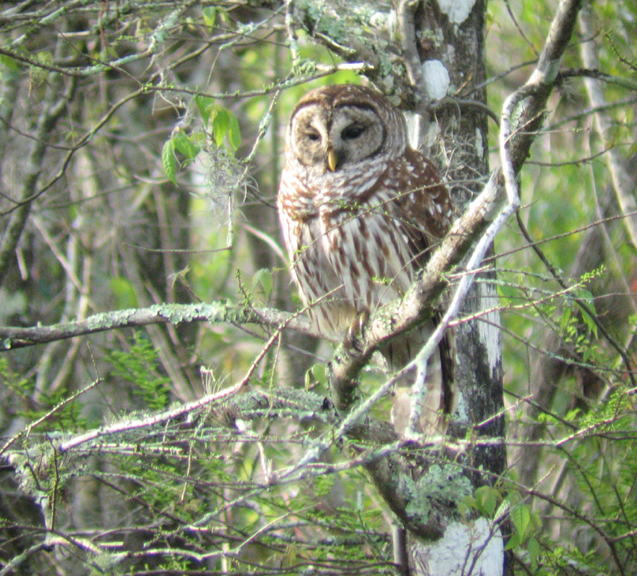 a Barred Owl flew in, perhaps to investigate the source of leader Lorne Malo's Eastern Screech-Owl tape. The owl remained for a long time, allowing leader Jeff Gordon to take a digiscoped image and me to take this photo through my binocular. A Yellow-bellied Sapsucker also flew by very closely, giving excellent looks at its striking plumage. At another location within the preserve, I enjoyed really good views of a White-eyed Vireo, thanks to Jeff, who later called in a flock of Brown-headed Nuthatches. What adorable birds! I'm offically smitten by their social behavior and rubber-ducky calls (which you can hear at the above link). A lengthy stroll led to another bridge, where I enjoyed taking pictures of the trees reflected in the water. Sometimes -- like when the alarm goes off at 4:15 a.m. -- I wonder about the sanity of this activity, but when I'm outdoors and soaking up the natural beauty and the birds, I question the sanity a little less. Know what I mean? 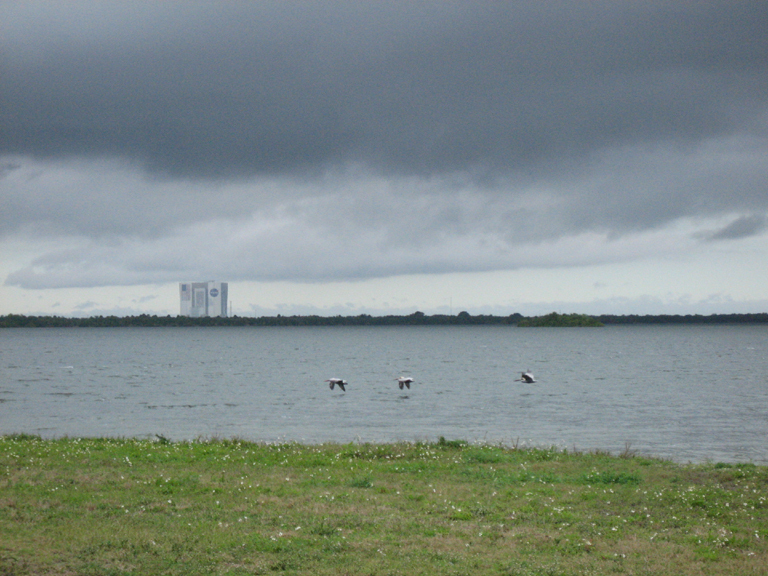 I totally lucked out with Friday's Zellwood/Lake Apopka field trip. The leaders included Gian Basili, Adam Kent, Alvaro Jaramillo, Jeff Bouton and Bill Thompson III. 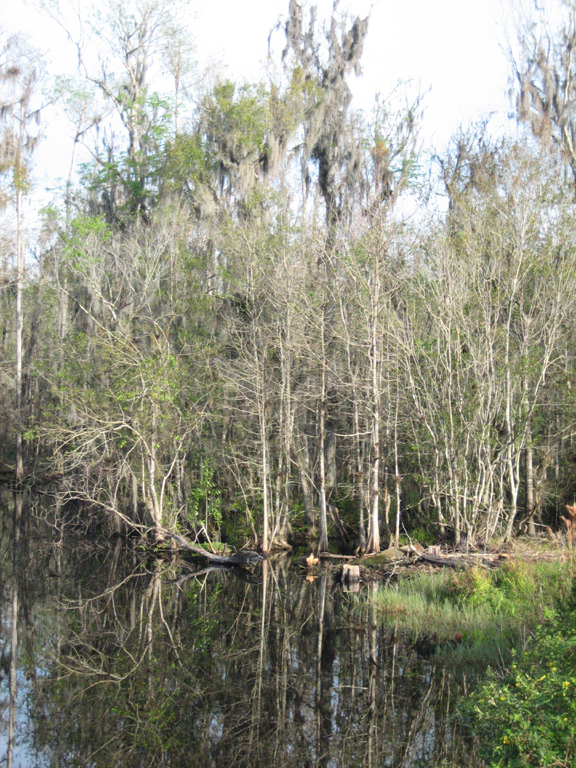 Gian works for St. John's River Water Management District as a conservation biologist and provided the inside scoop on the area's history (described in the link above) and current projects. I felt particularly welcome on this trip when the buses turned right onto Hooper Road, leading to the first stop and the three Common Ground-Doves huddled together -- a female between two pinkish males. They inspired much scopage and photography. I completely related to the huddling doves. The cold temperature made me crave body heat, too. Next time, my suitcase will hold a windbreaker, mittens, silk long johns and a knit cap. I had no idea that Florida could be so chilly! We walked down a trail with stops here and there. I particularly enjoyed the Palm Warblers pumping their tails, Northern Harriers and American Kestrels. 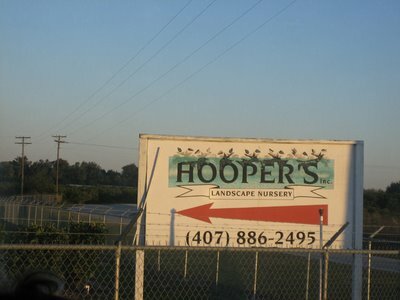 A ride in the bus took us to Lust Road, where the roller-chopped vegetation enticed many raptors. I loved seeing so many birds of prey - Bald Eagles, Red-tailed Hawks, Red-shouldered Hawks, Sharp-shinned Hawks - perched on snags and the power lines or soaring overhead and calling. Here, Al helps with an I.D. on Lust Road. Farther down the road, we paused at a Barn Owl nestbox that revealed at least one occupant's head through the entry hole. Very fun to see the ghostly face appear in the shadowed nestbox. where we saw a Purple Gallinule feeding on the opposite bank. 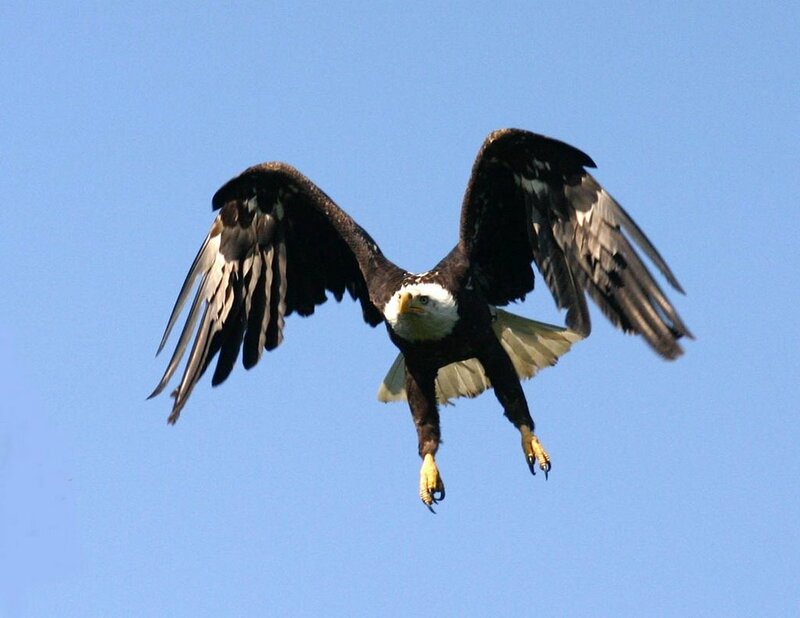 What an incredible-looking bird! The last stop included this sight. I so enjoy the eerie appearance of Spanish moss. I especially enjoyed the great look at a Limpkin, along with Black-necked Stilts and Glossy Ibis. Our trip included many other species, but you'll just have to go on the field trip yourself to know what they are! 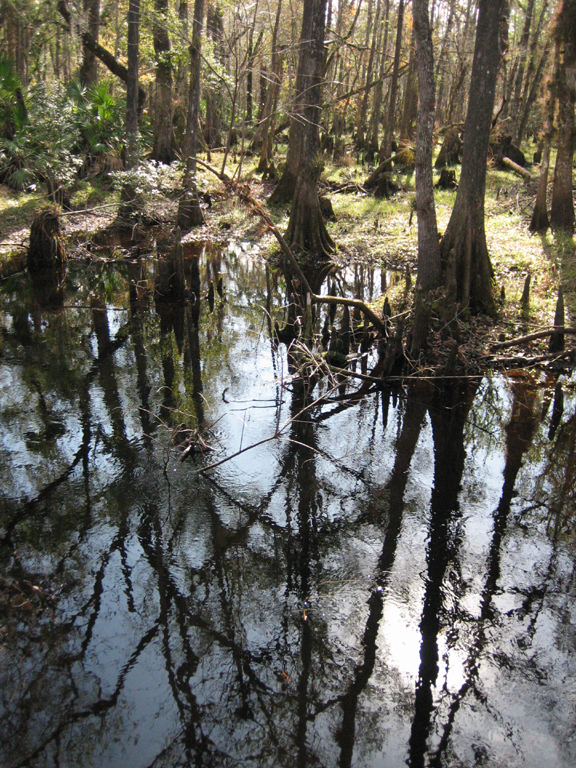 After my flight landed in Orlando at 4 p.m. and I got my hands on a rental car, I zipped east toward Titusville. Time was of the essence, and luckily only one toll booth slowed my progress on 528. I arrived at Brevard Community College with enough time to pick up a registration packet and say "hello!" to a few colleagues in the exhibit hall before walking to the auditorium, which was my ultimate destination. Bill Thompson III gave an entertaining and hilarious keynote speech tonight, melding the perils and pitfalls of birding with the admonition that "whatever you do, don't become a birdwatcher." BT3 shared trade secrets about birding as well as tidbits about his "sad little life," as he jokingly put it. * Many folks say that all you need to become a birdwatcher is a binocular and a field guide. That's wrong. You need tons of items, including multiple feeders of various types because "birds are picky, the little jerks." * While modeling a binocular harness and extolling its virtues over those of a neck strap, BT3 referred to the harness as a "man-sierre" and pointed out that it lifts and separates. * Birdwatchers also need to keep their optics clean, and optics reps in the exhibit hall might share cleaning supplies "if you blush becomingly." BT3 displayed a cleaning cloth and said, "These are pieces of Jeff Bouton's Scooby Doo pajamas. He's sleeping without them so we can use clean binoculars." If you have a chance to attend a presentation by BT3, then do it. Trust me. With a delightful introduction involving a 1931 guide to all of Australia's birds, Snail of A Snail's Eye View presents the new edition of the biweekly birding carnival. I was pleased to see all the new contributors. Thank you for hosting the carnival, Snail! The deadline for the next edition is Tuesday, Feb. 6. Mark your calendar! 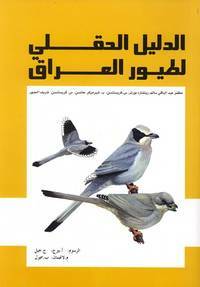 A joint effort between BirdLife International and Nature Iraq recently resulted in Field Guide to the Birds of Iraq in Arabic. The Canadian government and the World Bank covered the cost of the guide, described as the first illustrated and complete field guide for an Arabic-speaking nation. "These are some of the most wildlife-rich sites in the Middle East, but often all we hear about is the conflict," Richard Porter, BirdLife International's Middle East adviser and co-author of the guide, said in a statement. Iraq has 387 bird species, many of them native to the marshes in the south of the country where the Tigris and Euphrates rivers flow toward the sea, an area that has been described as the likely location of the biblical Garden of Eden. For more details about the field guide, click here. 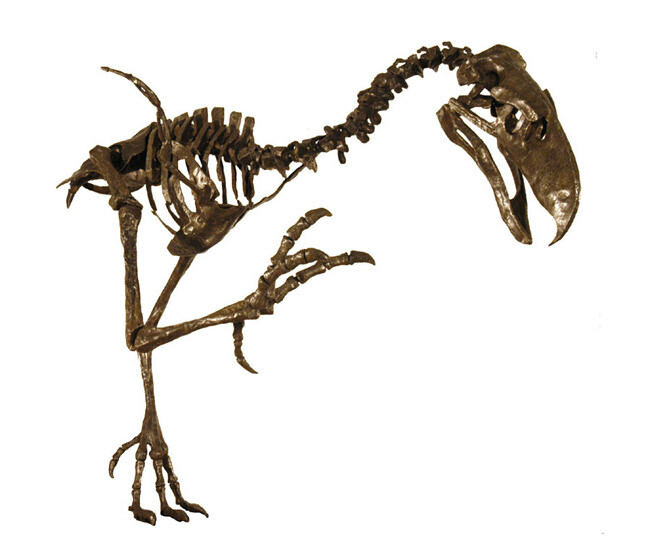 The February issue of the journal Geology reveals a new study in which scientists say that a 7-foot-tall carnivorous bird came to North America from South America. The terror bird (Titanus walleri) weighed 330 pounds and could bite dog-sized prey. 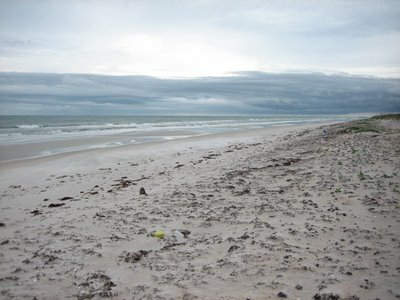 Fossils found in Texas and Florida were 2 million years old, according to a dating techique that uses rare-earth elements rather than carbon. More details here. Lookit the size of that beak! 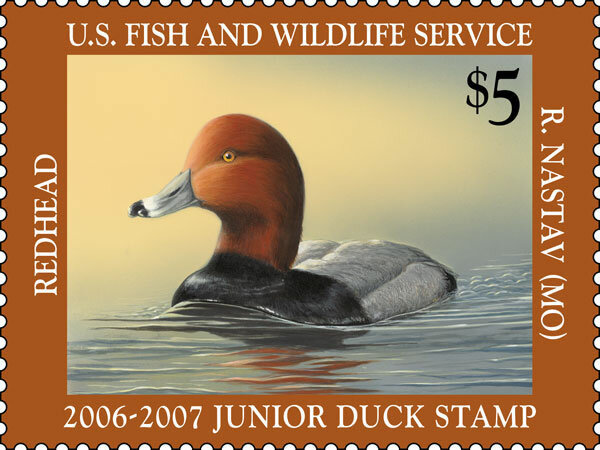 The Junior Duck Stamp art contest celebrates its 15th year in 2007, and the program anticipates that 27,000 students will participate this year. Ranging from kindergarten through high school, the students submit drawings of a duck or goose, usually after learning about wetlands and visiting a national wildlife refuge. 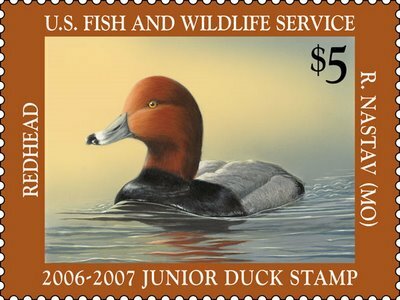 State winners enter the national contest, and that winner's art becomes a stamp, is sold at federal post offices for $5. The proceeds go toward cash awards for winning students and environmental education. You can find more details about the contest here. 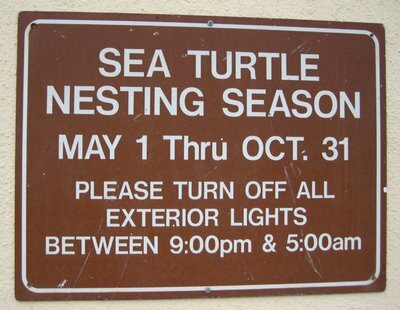 The official deadline is March 15, although some states have earlier deadlines. Please encourage budding artists to participate in this contest! Rebeccah Nastav, 15, of Missouri won the 2006 contest with this Redhead. For a couple articles about the 10th annual event, which will start on Wednesday, visit this and this. The former discusses digiscoping, and the latter focuses on the festival itself. If the airlines and the weather cooperate, I'll join the activities on Thursday evening and go on field trips on Friday, Saturday and Sunday. Can't wait! If you're curious about the 2005 festival, you can read posts about outings on Wednesday, Thursday, Friday, Saturday and Sunday. Other tidbits: up-close critters. 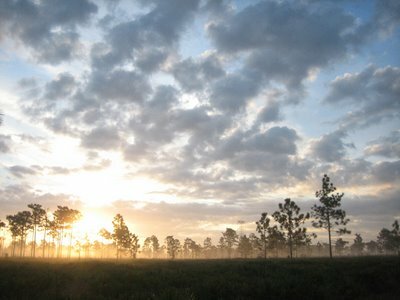 Jan. 31 is the last day to submit entries to the National Wildlife Refuge Association's second annual digital photo contest. Check out the prizes for the winning entries, which will be announced in mid-March. Images need to showcase birds, mammals, insects, fish, other animals, people, plants or landscapes found within a national wildlife refuge. Some photos will join NWRA's digital Refuge Image Library. Last year's winners appear here. 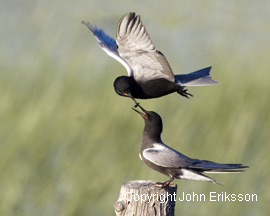 John Eriksson of Waller, Texas, won first place with his Black Terns photo, and he received a complete digiscoping setup from Swarovski Optik of North America. Scientists at Texas A&M University cited parasites and cold temperatures as the likely causes of death for the 63 birds found on Congress Avenue on Jan. 8. "We did not find any evidence that there was a public health problem, either from a poison or from an infectious disease," said Dr. Lelve Gayle, the executive director of the Texas Veterinary Medical Diagnostic Laboratory. 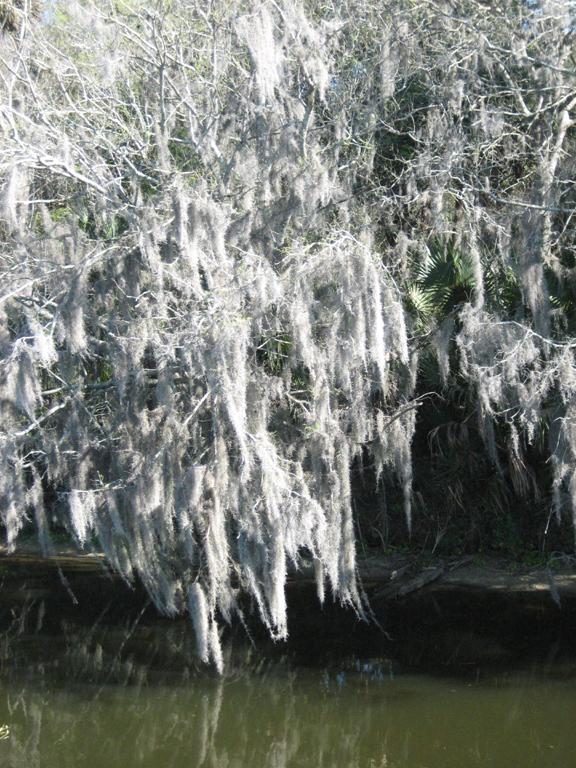 "These birds were heavily parasitized by multiple species of parasites," Gayle said. "These birds were sick." Officials had suspected poisoning, and their investigation continues. City Manager Toby Futrell, briefed on the A&M results, said health officials were awaiting test results from other agencies before announcing the cause of death. "There is no reason to believe the A&M results are not going to be right," she said. "The bottom line is that they have a negative test for poison." There was no indication the birds were poisoned. "Normally when you have birds that have been poisoned, you find food in their stomachs," Gayle said. "And we found no food in their stomachs." From Channel 13, WOWK in West Virginia: "Lit cigarette carried back to nest ignites blaze." Officials in the city of Huntington and the State Fire Marshal's office said the apparent cause of last Wednesday's fire at the Ratcliff Building was a bird that carried a lit cigarette into an attic of the building and into its nest. The fire destroyed the building, which housed five businesses. A report like this adds fuel (no pun intended) to my dislike for smokers who drop still-burning and used cigarette butts onto sidewalks, roads, beaches and other public spots. The Environmental Protection Agency published its proposed rat poison mitigation plan, which likely would decrease the number of birds that die after eating poisoned prey. The plan calls for three of nine rodenticides to become restricted-use chemicals, so that only certified individuals can apply those pesticides. The nonrestricted poisons, available over the counter, would need to be in tamper-resistant bait stations. The EPA link provides details about submitting comments during the 60-day comment period that begins today. 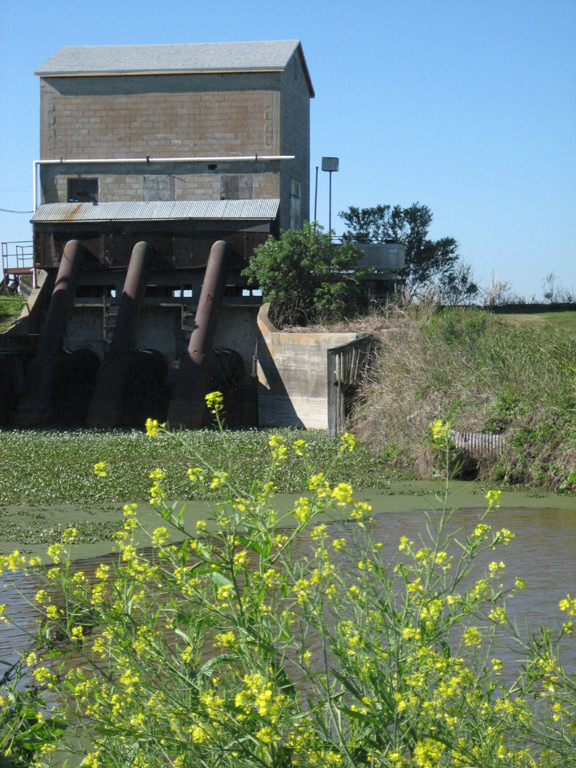 If you have questions or concerns about the proposed plan, share them with the EPA! Shawneen Finnegan's multiple talents came to my attention soon after I began working on WildBird. While contributing to the magazine as an advisory board member, she writes, draws, paints, takes photographs and gives presentations and workshops. 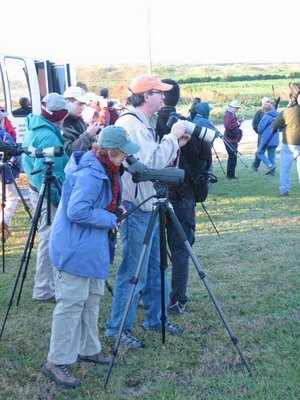 She also has served on bird record committees in California and New Jersey and led birding tours. Although she's planning to move soon, Shawneen currently lives in Tucson, which is where I finally met her. 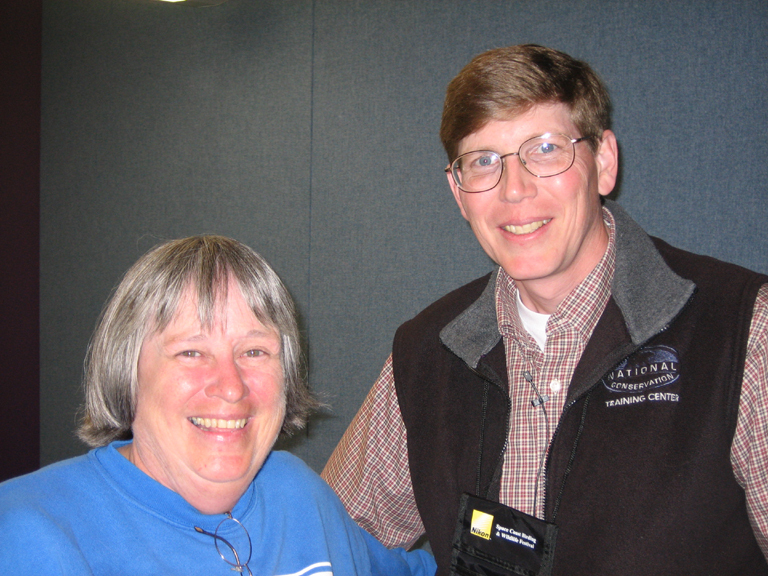 We crossed paths during the American Birding Association convention in July 2005. I hope that we'll cross paths again after she lands in Oregon. And now, a glimpse into the experiences of the multi-talented Ms. Finnegan. My interest in birding was sparked in my mid-20s while working in my mother’s yard, located in the foothills of the San Francisco peninsula. The yard was very overgrown, and after a number of weekends trying to tame it, I decided to write my first list of what I had seen: 12 species in all. Without a field guide, my names for them were, for example, Blue Jay, Brown Thrasher and Red-headed Woodpecker. In reality, they were Western Scrub-Jay, California Thrasher and Nuttall’s Woodpecker. Have you always sketched birds? No. At age 3, I began drawing horses, which continued into high school. My drawing of birds began in the mid-1980s. At first, it was mainly to document rare birds that I had seen. With lots of practice--studying photos and live birds, occasionally dead birds or museum specimens--my work improved to the point where they were of publication quality. One of the benefits of drawing birds is that you have to look much more closely at them and learn how their bodies are constructed. Feathers are amazing. I don’t know of a better tool for learning to observe how a bird is constructed--patterns, shapes and bird topography--than using a pad of paper, a pencil and eraser. What’s your most amusing experience as a tour leader? Many funny things happened on tours, though not always funny to the clients. The most amusing tour was spending a week with a group from the Chicago Ornithological Society. My van was filled with wild and hilarious women, and we laughed the entire week. The folks that preferred a quieter traveling experience rode in the other van. I have never laughed as much on a tour. Describe your feeder setup at home. Not much at the moment as I am trying to sell my house to move to Portland, Ore. At the moment, several hummingbird feeders are set up year-round. Niger has been my favorite seed as it isn’t as messy and doesn’t attract as many House Sparrows and Rock Pigeons, which have dominated the normal sunflower mixes because the house is located mid-city. Right now the canyons of southeastern Arizona, of which there are many--Madera Canyon in the Santa Ritas, Cave Creek in the Chiricahuas and many of the canyons in the Huachucas. Sweetwater Wetlands is my favorite local spot in Tucson. In the winter, I love going to the Sulphur Springs Valley to look at scads of cranes, Ferruginous Hawks and all the sparrows and Lark Buntings that abound down there in this largely agricultural valley. Other loves have always been coastal California, where my passion for birding began, and the seven years living in Cape May were pretty hard to beat. 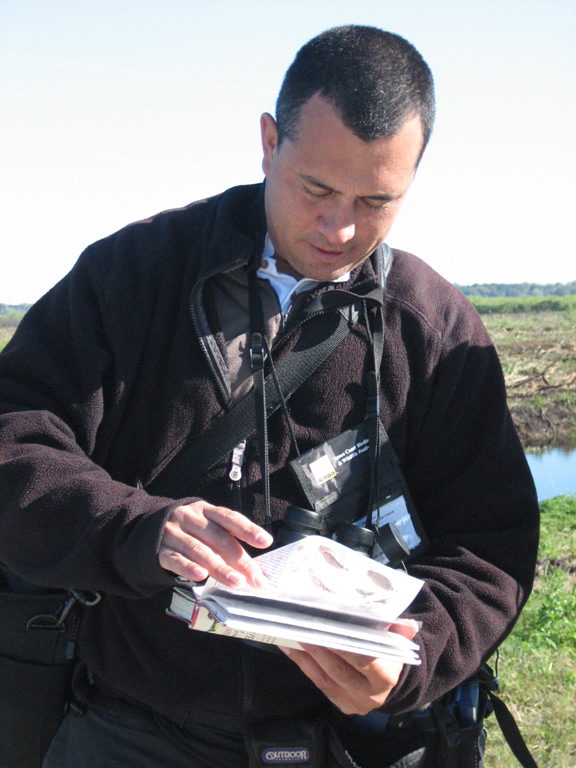 How would you describe your tenure on bird records committees in New Jersey and California? Very educational, rewarding and challenging. 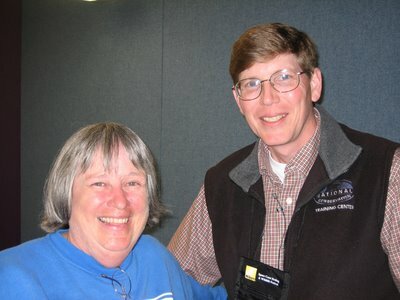 Because I met California birders like Jon Dunn, Kimball Garrett, Paul Lehman, Guy McCaskie and Joe Morlan early in my birding career, I developed a great deal of respect for the California Bird Records Committee. If a record of mine was to be accepted by the CBRC, my documentation had to be really solid. It was much harder back in the 1980s and 1990s to document rarities. Recognizable photos were much more difficult to take, and your written description had to be sufficient enough to stand on its own without a photo, tape recording or video. Learning bird topography, aging and sexing, molt and so much more was crucial to being an accomplished birder--and that is what I wanted to be. Before the Internet, being on the California records committee allowed access to knowledge that was often learn otherwise. What a privilege it was to be the first woman to be elected to the committee during its 20 years of history. The New Jersey records committee was much more relaxed and had different voting procedures and fewer birds to vote on than California did. How different it is today when fabulous photographs can be taken through telescopes with digital cameras and/or videos from amazing distances, and you can get images of details of identifying features that you previously would get only if you captured the bird and examined it in the hand. Hearing the sound of a rubber duck means only one thing to me: Sulphur-bellied Flycatchers! That squeak is one of my most favorite avian sounds. Hearing one always makes me bubble up inside with joy. My dream birding trip would be to spend a few months in the Southern Hemisphere visiting South Africa and Madagascar, or Australia and New Zealand. Just imagine all the fabulous land birds you would see. Who wouldn’t want to see a fairy-wren or a Lyrebird in Australia or the groundrollers and vangas of Madagascar? And how about all the cool birds, animals and plants that South Africa has to offer? Going on pelagic trips down yonder would be a must to see tons of albatross, prions, petrels and so much more. And while looking at the birds, add the cetaceans, lemurs and African critters, not to mention marsupials! As to when it will happen and who could go on such a long trip, that is a good question! Just in case anyone thinks that birding magazine editors have it made, well... you're right. Sorta. Editing and writing about birds, choosing great photographs, traveling to events and meeting wonderful folks make for a fantastic gig. I really enjoy it. Then there are weeks like this previous one that balance out the ledger. I worked Sunday through Thursday up to 13 hours a day trying to meet Thursday's deadline for the March/April issue. You might wonder if I'm a disorganized mess -- well... not completely, just the only one pulling together the editorial content and handling last-minute challenges. So, there was the deadline to theoretically conquer (that didn't happen). Then there was Thursday's red-eye flight to Atlanta, followed by a trade show to which copies of WildBird never arrived. Sunday night's flight from Atlanta left 90 minutes late, giving me the chance to run for my connection in Phoenix and to arrive in O.C. (note the lack of "the," JP) without my luggage. On the upside, I received the chance to meet more retailers who want to sell the magazine, learn about new products, meet more birders and manufacturers, spend time with friends who live around the country, enjoy the atmosphere at Spondivits and find a nearby spot for karaoke, dancing and people-watching. Those delights have buoyed me today while finishing the March/April issue and preparing for another magazine's deadline this Thursday. Those delights likely will occur again soon at Space Coast Birding & Wildlife Festival in Titusville, Fla. I can't wait for the flight to Orlando on the 25th. Who else will be at Space Coast? After landing in Atlanta 90 minutes later than scheduled this morning, I enjoyed hearing Birdchick's voice via the cell phone. About an hour later, we visited the executive lounge at the Hilton Atlanta Airport, which offers an excellent breakfast spread with yummy fresh fruit. Ah, just what a sleep-deprived traveler appreciates! Time to visit the Georgia International Convention Center and set up the WildBird booth for Birdwatch America! 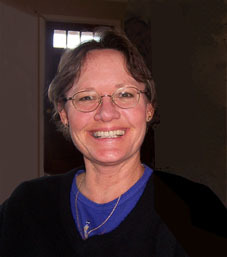 I'm looking forward to hearing Sharon's presentation at lunch during the Birding Business retail workshop. Then I'll introduce Hank Weber's seminar about merchandising and being a better retailer. Tonight's cocktail reception for retailers and exhibitors at the convention center should be a fun gathering of familiar faces. This weekend, watch for updates from the three (if not more) bloggers in attendance! home of the Hawks, the Thrashers and the Falcons -- to participate in Birdwatch America, the annual trade show for the birding industry. How did one city garner multiple bird-named sports teams? Before hopping on tonight's red-eye flight, I need to finish the March/April issue, which includes the entry form for the annual photo contest. The grand prize is a doozy! This short video discusses the hundreds of Barn Owl carcasses found along Interstate 84 in southern Idaho. Boise State University biology professor Jim Belthoff gathered the carcasses during a short study to determine how many owls were being killed by vehicular collisions at night. Belthoff collected 800 -- enough to fill three freezers -- and surmised that thousands of owls are dying along the interstate. He cited a European study that showed Barn Owl populations becoming extinct along highways. Has anyone heard or read more details about bird carcasses on Congress Avenue that prompted a 10-block shutdown in Austin this morning? Emergency workers donned yellow hazardous-material suits, and dozens of fire trucks and ambulances were parked nearby, as they began testing for any sort of environmental contaminant or gas or chlorine leaks that might have cause the bird deaths. There were no reports of any people harmed. A 10-block stretch of the main north-south route through downtown was blocked off as were several side streets and all buildings in the area. They were expected to remain off-limits until about noon, said police spokeswoman Toni Chovanetz. "There is no credible intelligence to suggest an imminent threat to the homeland or Austin at this time," said Department of Homeland Security spokesman Russ Knocke. Homeland Security, the Department of Health and Human Services and state authorities are monitoring the situation, he said. UPDATE: Sixty pigeons, sparrows and grackles were found dead on Congress Avenue. Preliminary air-quality tests didn't reveal dangerous chemicals, and the 10-block area reopened after noon. Experts at the Cornell Lab of Ornithology and the National Audubon Society said the most likely cause was a deliberate poisoning of the troublesome grackles, which is more common than people think. It's also legal, with local permits, said Greg Butcher, director of bird conservation at the Audubon in Washington. Austin officials were smart to take it so seriously, though, Butcher said, because birds' "requirements for life are pretty similar to our requirements for life" so they can serve as an early warning for risks to human health. The judges faced a difficult challenge in this month's fiction contest, and they again chose Beverly Robertson of Hewitt, N.J., as the winning scribe! She now gets her choice of two recent books from the WildBird bookshelves. Thank you to this month's participants! Keep up the great work! I can't wait to see your next entries. Please submit stories for the February edition by Jan. 31. For your reading pleasure: Beverly Robertson's "Whatever." Pam trailed behind her aunt. She had not wanted to come to Ohio for the holidays. She wanted to spend Christmas break hanging out with her friends, but her mom had insisted. So here she was, walking in a flat open park the day after Christmas with an aunt she barely knew when she could have been shopping at the mall with Jennifer and Inez. Whatever. At least she was out of the house. The wind whipped across the open fields and stands of cattails. Pam’s eyes were tearing badly from the wind and her nose running from the cold. It didn’t help that her aunt stopped every two minutes to look out across the fields. What could she be looking for? Pam didn’t see anything, and she was freezing. She sniffed, walking on. Whatever. She shoved her hands in her pockets and turned her back to the wind. She had not particularly wanted to come on this outing, but she would have done anything to get out of the house. Her mother was having a great time. Pam, on the other hand, felt alone, trapped in her grandmother’s house. There was nothing to do. There was no TV. She was fed up with visiting relatives, and her cousins were all dorks. She felt she had nothing in common with any of these people. She walked with her head down, deep in her funk. Pam had assumed when her aunt asked if she wanted to go for a walk in the park that they would do just that: walk in the park. Or maybe talk. Instead, her aunt was peering through binoculars at nothing. Pam sighed again. Whatever. Her aunt stopped and pointed right, to a path that led through some trees. Pam shrugged. Whatever. Her aunt was pointing out birds as they flitted in the trees and weedy edges of the path. Pam could see only little brown birds flying hither and yon. She nodded politely. At least there was something to look at. Out of the corner of her eye, she saw something bright blue flash by. She stood still, shocked--her mouth open. They watched as the bright birds flitted through the trees. Pam was stunned. She had never seen such a thing. They were like Christmas ornaments. Even on a gray December day, the color popped out of the woods. For the rest of the one-mile loop, she kept pointing out more bluebirds. They seemed to be everywhere. Pam tried to identify the exact hue of blue. Was it indigo, or maybe cerulean? She pictured the color wheel from art class. Her aunt explained that there were different birds that were indigo and cerulean. These were just blue. Pam blathered on and on. On the way back to the car, Pam looked over at her aunt. “Can we try to see them again tomorrow?” she asked. Her aunt smiled to herself. Yeah, whatever. Luke Seitz, who won the 10- to 13-year-old 2005 Young Birder of the Year award from the American Birding Association and Leica Sport Optics, participated in a recent Christmas Bird Count and appeared in the local media. Seitz has participated in Portland/Freeport counts for the past three years, but this was his first Biddeford-Kennebunk count. He did the Portland count in the snow the day before, and was enjoying the sunshine on Sunday. Seitz first became interested in birds when he was a young boy of six or seven. 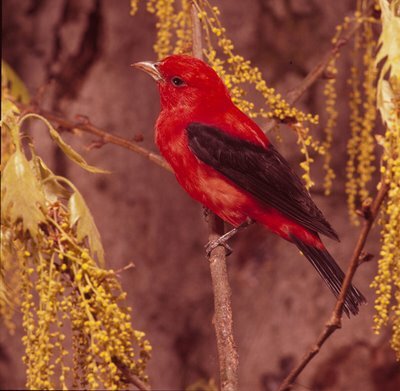 After spinning around and falling to the ground one day, Seitz looked up and spotted a male scarlet tanager. He was intrigued and went to a local nature center to learn more. That's all it took -- a Scarlet Tanager -- to get and hold a youngster's attention. Would you like some humor with your duck? A humorous lead in a mainstream article about birding just might be the lure that successfully gets readers to stick with the article, learn more about this hobby/ sport/lifestyle and become involved. The ducks are back in town. Millions, or so it seems, crowded along the bayshore, the restaurant row for the waterfowl set. If there were a duck Zagat Survey, the old salt ponds ringing the South Bay would score high on decor ("request a levee-view") and food ("the invertebrates are to die for"). 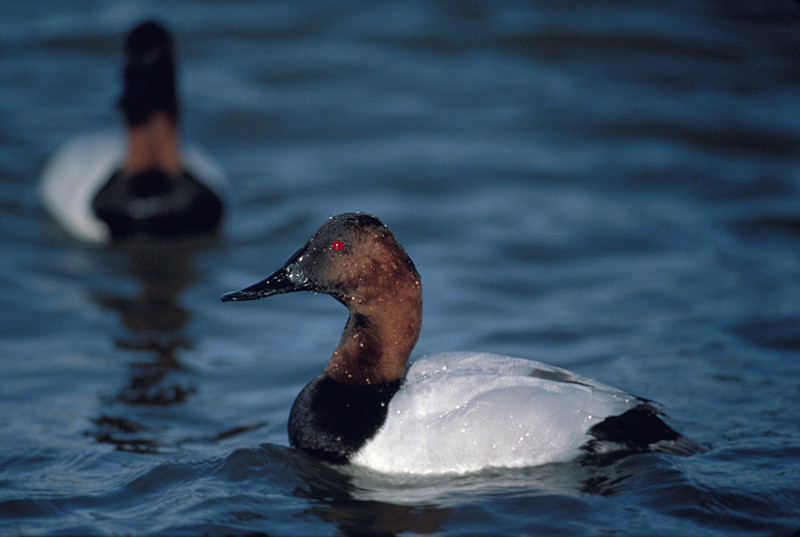 Take a peek at this nice piece about ducks in California's Bay Area.